A soggy Stray was the destination for 6 Striders on Saturday as they took on the Harrogate pakrun course in reverse! Julian Carr (23:18) kicked on in the last lap to finish ahead of Graeme Kilvington (23:35) by 17 seconds to be first Strider home. They were joined by an improving (post injury) Nick Wallen (25:18), Anthony Everitt (27:33), Tracy Allison (28:18) and volunteer tail runner James Wright (54:59). The Halloween spirit made its way into one of the timing devices at Fountains Abbey meaning that a number of times were missing. Guy Close dodged the gremlins however and recorded a time of 20:11. Dawn Richardson was also in attendance, using the event as a warm up for Sundays Guy Fawkes 10 race, stopping the watch in 31:26. Working our way down the country, Clare Aynsley attended the Newark event, clocking 32:43. Down in London, Derek Calvert achieved a time of 23:12 at Crystal Palace. The annual Guy Fawkes 10 mile race, organised by our friends at Nidd Valley Road Runners, was held in warm conditions on Sunday morning. The course is one of the toughest events on the local racing calendar, providing a real test for the 11 Striders who attended. 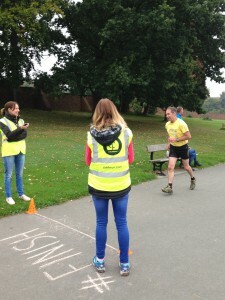 First back into the finish area at Ripley Castle was James Wright who set a time of 01:13:26. Next up were Dan Wilson (01:18:16) and Conrad Garcia (01:19:23) who’s time saw him leapfrog James into 3rd place in the Club Championship standings. As has been the case all season, Nicola Carter and Sima Lowery battled it out for first Female Strider home. Nicola came out on top, recording a time of 01:21:38, to wrap up the Club Championship for 2015 with one event to go. Sima followed shortly behind in 01:22:05. Next back to collect his chocolate (great goodie bags!) was Julian Carr (01:28:28) and he was chased down by Pamela Singleton (01:33:13), Andrea Price (01:44:11), Dawn Richardson (01:48:39) and coming across the line together were Katie Gray and June Graham who both clocked 02:00:05. See Eric’s earlier post for a roundup of Club Championship standings. Perfect running conditions greeted 140 runners at the inaugural Whixley 10k. Striders made up 10% of the starting field, with 14 members in attendance. The course was very much multi-terrain and was a good test for the winter trail shoes that were coming out of hibernation! The first 3 Striders home were split by only 3 seconds. Andy Robinson (41:28) was in a photo finish with the ever youthful Ian Mitchell (41:29) and they were closely followed by Guy Close (41:31). James Wright (43:13) was next across the finish line, with Phil Cornforth (44:07) 5th Strider back. A close knit pack of female Striders came in just over the 50 minute mark. They were led home by Sue Morley (50:07), with Nicky Christie (50:24) and Anna Cornforth (50:52). They were joined at the event by club coach Eric Morley (53:09), Tony Everitt (55:18), Tom Burell (56:37), Lucy Cartwright (57:42), Tracy Allison (58:16), Andrea Price (59:01) and Alison Jackson (01:04:15). The Cross Country running season is about to start up for the Winter months, therefore please find a summary below of current fixtures that Striders are encouraged to attend. The Yorkshire Cross Country Championships will take place at Lightwater Valley on January 19th 2016. The Northern Cross Country Championships will take place at Witton Park (Blackburn) on January 30th 2016. The National Cross Country Championships will take place at Donnington Park on February 27th 2016. Please see Eric if you have questions regarding any of the above events. The rain just about held off for parkrun on Saturday morning, giving the chance for 9 Striders to start the weekend with a 5km run. At Harrogate, Run Director Sean Brennan was first back for the club, just missing out on a PB with a time of 21:50. Nicola Carter was second lady home, clocking 22:19. 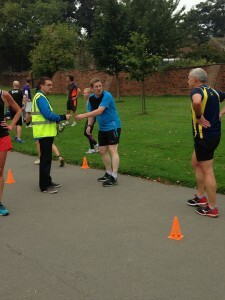 Recent parkrun convert Graeme Kilvington had a solid run to finish in 23:11. Just behind Graeme was Derek Calvert, who achieved a PB in a time of 23:18. Anthony Everitt stopped the clock on precisely 27:00, followed by Tracy Allison (27:46) and Nick Wallen (28:41). Fountains Abbey was visited by Clare Aynsley for the second time in three weeks. In her 7th parkrun, she stopped the clock in 31:20. An overrunning business trip on the South Coast allowed Julian Carr to visit his 8th different parkrun, recording a time of 22:58 at Poole. The next club parkrun trip will be to Roundhay Park on Saturday 7th November. Meet at KCC for 8am (8:05am departure) – a car sharing scheme will be in operation. Please let us know if you will be attending by placing your name on the sheet on the club notice board or alternatively let us know via email or facebook message. After many hours of planning, a group of 13 made the short hop across the North Sea to Holland on Friday 16th October for the Amsterdam Half Marathon. The excitement started to build on the Saturday morning with a visit to the Olympic Stadium, scene of the finish area for the event, to pick up the race numbers. The pickup was held alongside a great ‘Expo’, providing the opportunity to try out the latest running gear and get some great ideas for next year’s Striders trip – anyone for the Reggae Marathon in Jamaica?! The rest of Saturday was spent chilling out in preparation for race day on Sunday. Some of the group took in a canal cruise – “when in Rome” – with others taking in some of the other ‘sights’ of Amsterdam before heading back to the hotel for a carb loading ‘Pasta Party’. When the food arrived it was great….unfortunately the wait for it took the shine off what otherwise would have been great preparation for the running to be undertaken the next day. A grey, wet and cold Sunday morning greeted the group on Sunday. With the Half Marathon not starting until 13:20, it was a chilled out morning at the Hotel. In an added bonus to the weekend, the hotel was located directly next to the Marathon and Half Marathon route allowing us to view the front runners of the morning Marathon come through. They came through at an extraordinary speed – reaching the hotel at the 26km mark, but still absolutely flying down the course (winner clocked a time of 02:06:19)! Onto the main event of the day, a short hop on the metro took the Striders group back to the Olympic Stadium for the start of the Half Marathon. Conditions had improved slightly to provide perfect running conditions – 10c, some drizzle and no wind – for the 8 members taking on the race. The 13.1 mile route was sure to be flat and offered PB potential for all involved. The first couple of miles took the runners through streets that included tram lines, providing an interesting obstacle to overcome – slippery when wet! Miles 3-6 saw the participants run past the Striders hotel (no one took the option of dropping out here!) and through some rather dull industrial areas, although the DJ’s blasting out music from some converted camper vans provided some great motivation. Gradually the route headed into the central areas of Amsterdam, passing the Heineken Brewery and Rijksmuseum around mile 10, before heading into the stunning Vondelpark (Amsterdam’s equivalent to New York’s Central Park) for miles 11 and 12. The last mile had fantastic crowd support, leading the runners into the Olympic Stadium for the last 350 metres of the race on the athletics track. Martin Brock was first Strider home, having a superb run to finish in 01:25:46. He was joined by Andy Robinson (01:29:25), James Wright (01:29:55), Dan Wilson (01:30:07), Julian Carr (01:46:40), Andrea Price (02:07:36), Dawn Richardson (02:09:52) and Natalie Hale (02:19:00). A big thanks must go to the 3 supporters – Clare, Emma and Simon. They gave some fantastic encouragement, took great photos and provided excellent bag handling facilities! Overall, the first Striders European trip was a huge success. The planning for potential 2016 trips is well underway, with a focus on events that will provide options for all levels of running ability. Details will be released in early November on the club website, Facebook and Twitter. 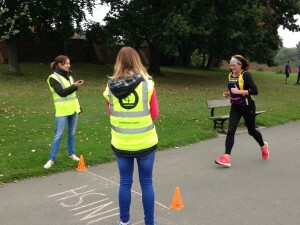 A rather belated round up of results from last weekend – apologies for the delay! There was a good turnout of 6 Striders at Harrogate parkrun, with Guy Close leading them home in 19:57. 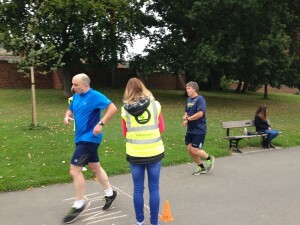 In his first parkrun for a while, Ian Mitchell achieved a time of 20:43. Next up was Phil Chatterton, who ran a course PB in 22:56. Also in attendance at the Stray were Anthony Everitt (27:10), Tracy Allison (27:47) and Rob Charlesworth (28:27). Nicola Carter undertook some parkrun tourism, finishing in a time of 23:27 at Parke parkrun which is situated in Devon. This event is also the ‘local one’ for Brenda Grant who recently moved from North Yorkshire down to the area. Brenda completed the course in 38:14. The first Striders European Trip was a huge success. Cool conditions greeted the 8 Striders running in the Amsterdam Half Marathon on Sunday afternoon, with a number of PB times recorded. Martin Brock had great run, finishing in 01:25:46, to lead home the Striders contingent. He was joined by Andy Robinson (01:29:25), James Wright (01:29:55), Dan Wilson (01:30:07), Julian Carr (01:46:40), Andrea Price (02:07:36), Dawn Richardson (02:09:52) and Natalie Hale (02:19:00). A full report on the event can be found within the news section of the club website. A great night on Tuesday at the Predictor Run. Thanks to Eric Morley for organising the event and to those who helped record times, marshal or cook the post run food! In the 5km run, there was a three way tie for first place. 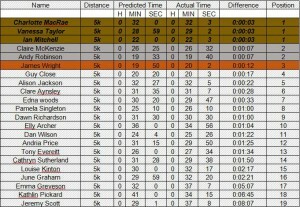 Ian Mitchell, Charlotte McRae and Vanessa Taylor were all within 3 seconds of the pre-run predicted times. It was also a tie for second place, with Andy Robinson and Clare McKenzie only 7 seconds out. 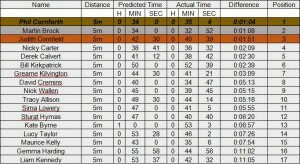 Third place was taken by James Wright who was 12 seconds off his predicted time. 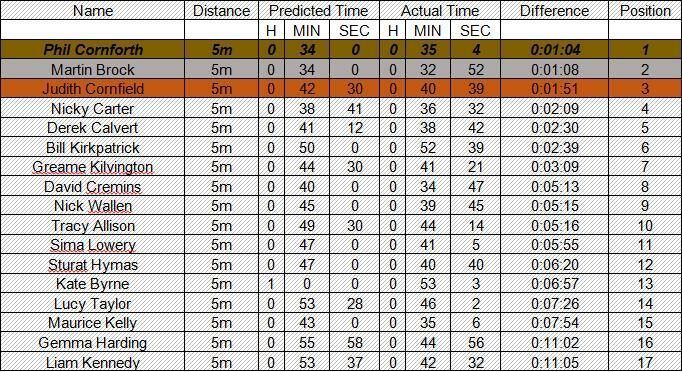 The 5mile event had some slightly larger differences in predictions! Taking first place was Phil Cornfoth who was 01:07 away from his predicted time. In second place was Martin Brock with a difference of 01:12. Third place went to Judith Cornfield who was 01:51 off her prediction. Well done to all who took part in the event! A bumper weekend of results for Striders….please let us know if any are missing! Starting on Saturday morning, Guy Close ran the Harrogate parkrun in a PB time of 19:46. Graeme Kilvington was next Strider home, achieving his 2nd PB in a row with a runtastic 22:57. They were joined on the Stray by Nick Wallen (25:33), Tom Burell (26:59) and Tracy Allison (29:23). At Fountains Abbey, Phil Chatterton took 6 seconds off his PB, finishing in 22:04. Chasing Phil down were Andrea Price (28:42), Dawn Richardson (29:52) and Clare Aynsley (31:08). Up in the North East, Nicola Carter made her second visit of the year to the Gateshead event, clocking a time of 22:11. On Sunday morning, 4 different events were visited by Striders. Starting with the ‘big hitter’, the club were well represented at the 3rd running of the Yorkshire Marathon. Stewart Hymas was first back, coming in under the 4 hour mark with a time of 03:50:47. Sean Brennan was next down the finish straight at York University, smashing his PB to record a time of 04:16:38. Undertaking her first Marathon, Club Secretary Alison Dales achieved a superb 04:25:01. 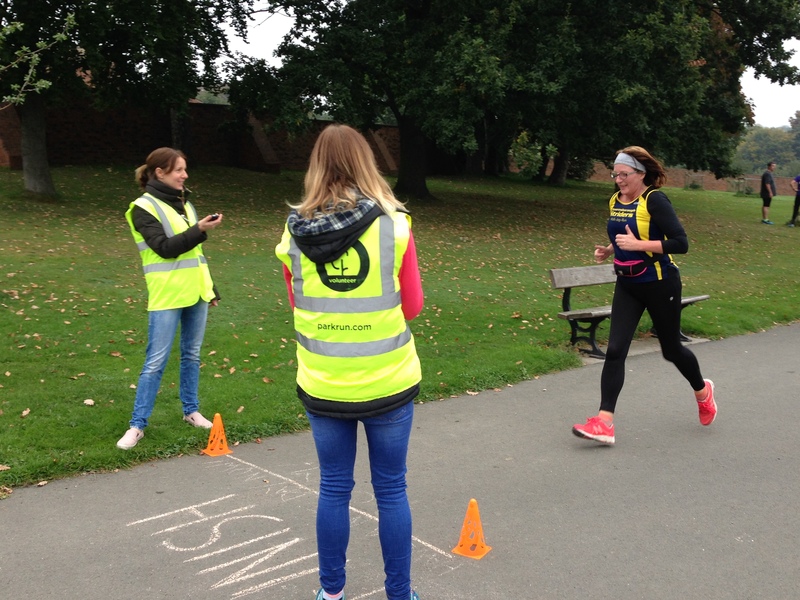 Jane Day also took on the challenge of the York based event, finishing in a fantastic 04:48:14. As part of the Yorkshire Marathon event, the inaugural York 10 Mile was also held on Sunday. Julian Carr and Rachel Hargreaves took part, recording times of 01:19:04 and 01:36:03 respectively. Taking on the VERY hilly Richmond Castle 10k race were regular racers Clare McKenzie and Karen McNaughton. They completed the course in 57:24 and 01:03:23. Dawn Richardson headed over to Scarborough for the Yorkshire Coast 10km race, clocking a PB time of 59:20. Well done to all – its great to see the club represented at so many different events. The latest club parkrun visit was held on Saturday, with 12 members taking on the challenging (hilly!) course at Temple Newsam. James Wright (20:22) was first back to the finish line in front of the impressive stately home, followed by Nicola Carter, who was first female overall, in a time of 22:09. Graeme Kilvington and Andy Roberts were neck and neck coming up the final hill, with finish times of 24:15 and 24:16 respectively. Following them were Sue Morley (25:53), John Greveson (25:51), Clare Mckenzie (26:43), Anthony Everitt (26:52), Eric Morley (28:09), Karen McNaughton (30:00), Edna Wood (31:29) and Tracy Allison (32:06). A few pictures from the event are below – please see the Gallery for more pictures. At Harrogate, Conrad Garcia recorded a time of 20:48 and he was joined on the Stray by Nick Wallen (25:09). At a foggy Fountains Abbey, Guy Close smashed his PB and achieved his first sub-20 minute parkrun with a time of 19:56. Julian Carr was also in attendance at the World Heritage site, clocking a time of 23:14. Our next club parkrun visit will be on Saturday 7th November. A draw will take place at training on Tuesday 13th October and the result published shortly after. The options are York, Bradford (Lister Park), Skipton, Wetherby, Roundhay Park or Woodhouse (Leeds). Get it in your diary – it’s a great way to start the weekend!